“Working on music equipment” counts as “working on music”, right? Whomever designs certain models of Line 6 “Variax” guitars is a sadist, an engineering genius, or both. You have to remove the neck to partially remove the pickguard to carefully disconnect several snap-on ribbon-cable-style connectors to finish removing the pickguard to access the electronics – you can’t remove the pickguard all the way until you disconnect the ribbon cables; you have to hold it “hovering” about an inch from the body while doing so, as the cables aren’t long enough, and aren’t kindly placed all along just one side, which would allow one to ‘flip the lid’ like you can on a (well designed) synth. And then you have to fish another little red-and-black-means-power cable with snap-on connector through a metal shielding cage and back with tweezers. Tweezers. 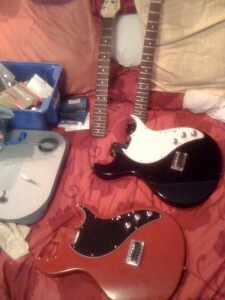 Two guitars field-disassembled, repaired, and reassembled: check. Akai AX-60 repaired: check. Juno-106 repaired: negative. Got the thing opened up and the board with the voice and problematic VCF-VCA ICs pulled, but ran out of time before getting all the chips desoldered and pulled for the “soak your 80017a’s in acetone to strip the resin” trick that’s all the rage these days. So it may be be a week or two before I find out if I’ve fixed the thing, or destroyed it. Roland SH-09 key contacts cleaned: rescheduled for a later date. At least I was able to swap the stock pickguards between the two to arrive at much-improved “black ‘n white” and “black ‘n red”, which in some imaginary, alternate universe gains some sort of “cred” for making my to-hell-with-the-purists “what the hell are you doing using that clearance-bin fake digital guitar, boy? You say that thing hooks up to a computer?” bits of glorified kindling look a bit more like old Melody Maker and Duo Jet color schemes to the undiscerning, non-guitar-wanker eye. Because being a proper indie-post-punk-hipster-whatever is all about caring very much about pretending not to care.